When people think about setting goals for the next year, people frequently think about setting New Years Resolutions. Can I ask you a question- do you actually keep your resolutions? But people who continually fail resolutions often like the idea of being able to implement new things in their lives regardless. Instead of trying to do everything at the start of the year, you should try to spread out your goals throughout the entire year! 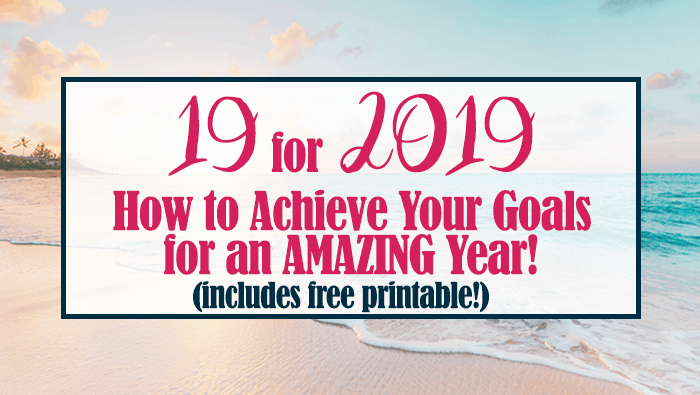 Thus, a 19 for 2019 list is a perfect way to spread out your goals and resolutions across the entire year. What is 19 for 2019? 19 for 2019 is a goal setting strategy exercise for you to select activities and behaviors you’d like to implement in the next year. The intention is to get you out, trying new activities, and pushing you out of your comfort zone for the upcoming year. People say they feel like time just races on by, and it certainly feels that way sometimes! By doing the 19 for 2019 list, you’re allowing yourself to engage in more purposeful activities that will hopefully help bring you closer to your goals. 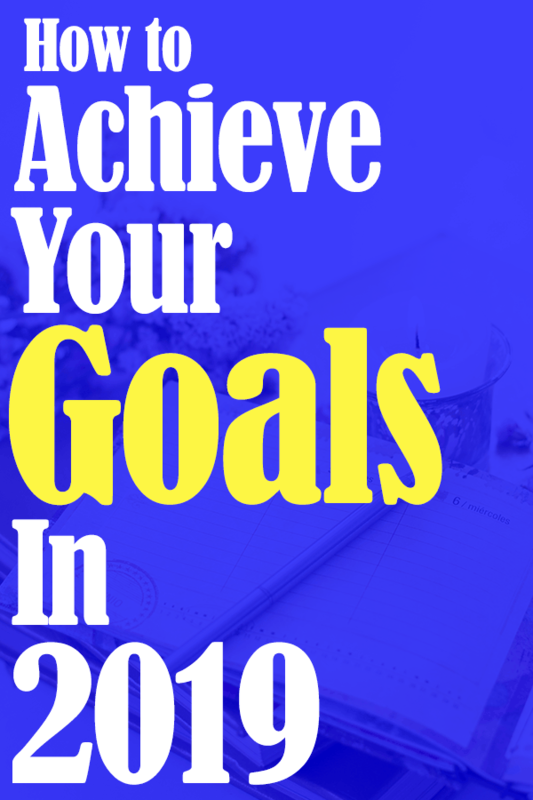 This article will help you optimize your 19 for 2019 list, and provide ideas and inspiration to add to your list. At the end, you can get your hands on a free printable to let you get started immediately! Remember that your list of activities should be activities that you can easily do within your time in 2019. If flying to another country is likely something that you can’t afford, don’t worry about putting that on your list for 2019! But consider engaging in activities that you can do in 2019 to help you reach your goal sooner, such as doing a saving money challenge. The most successful projects happen when you’re best able to evenly split your goals across the entire year. Trying to do too many things at the same time will likely lead to burnout, frustration, and giving up earlier. Intend to do 10-14 of these smaller activities in your 19 for 2019, depending on your comfort level. In all, you should plan to do no more than 3 long-term activities in your 19 for 2019. The last thing people tend to do is trying to pick things that are extraordinarily meaningful. Now, this isn’t bad, but if it’s not fun and meaningful for you to do, you’re going to find the process of trying to complete your checklist to be filled with joy. So definitely work on improving yourself or tackle big projects, as your 19 for 2019 is an amazing time to do this. Also make sure to relax, try new things, and have a good time as well! What Types of Goals Should You Pick? You can literally pick anything you want for your 19 for 2019 project! I definitely recommend sticking to the guidelines above to help make sure that you are more likely to find success. However, coming up with ideas can be tricky sometimes! Here are lots of great ideas to consider for your 19 for 2019! Travel is always a big favorite for goal lists. People love to get out and go explore while having amazing adventures. Here are some fun ideas to consider if you’d like to incorporate traveling into your 19 for 2019. Does it ever feel like you’re just constantly seeing the same things in your life over and over again? Or maybe you know you get sick of winter by February! Change your scenery and go someplace far, far away! It doesn’t matter whether you drive, fly, or hop on a cruise ship, go someplace new and have a vacation! One of the places that sparks tons of amazing memories of my childhood are where I went to summer camp for eight years as a child. And I was thinking the other day- I haven’t visited there in over 13 years! That made me feel a little sad, considering it was my favorite place to go every single summer. So if there is a place you love to go to, and you haven’t been there in a while, rekindle the magic and go check it out again! Camping is a lot of fun, full of adventure, and you always come back with a ton of fascinating stories to tell your friends. If technology is wearing you down and you’re ready to reconnect with nature for a while, go camping! It always seems like no matter where you go, you never have to travel far to enjoy a tent, a sleeping bag, and a star-lit sky. If going to a campground is a little challenging, go camping in your backyard! 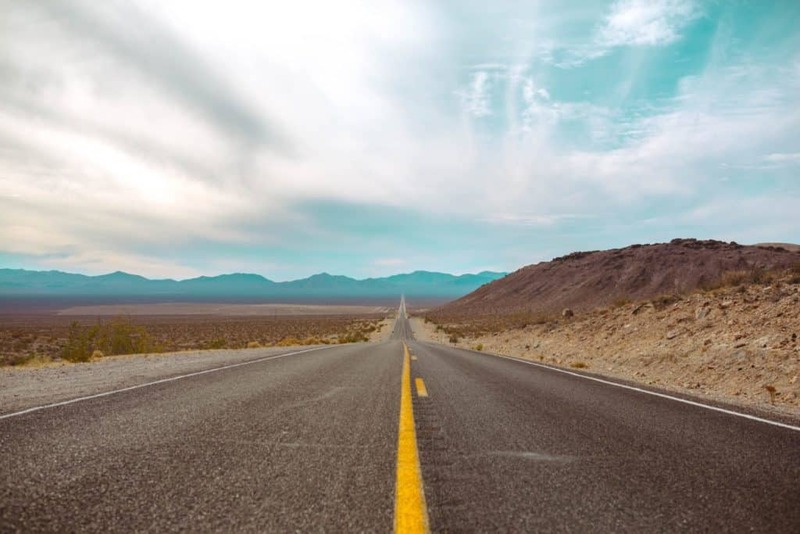 Road trips are terrific because you can always find adventure, whether it’s 30 minutes from your home or on the other side of the country. Learn more about events and sights close to where you’re at, visit a nearby state you’ve never been to, or meet a faraway friend someplace in the middle. Have you ever stayed at a bed and breakfast? I’ll tell you what- I haven’t either! But I’ve always wanted to. They are a little more unique from a hotel in that you’re spending time with other people also passing through for meals. You’re basically sharing somebody’s home that they’ve opened up to for guests and visitors! But it can be a wonderful way to travel and make new connections at the same time. People love to envision starting these new, amazing habits for the new year. Well, it turns out almost all of the people who will set these goals for their New Years Resolutions will ultimately fail. Thankfully, while you’re using your 19 for 2019 to improve yourself, you don’t have to change all your new habits on January 1st! Try sprinkling in new habits and routines across the entire year to help make your 19 for 2019 be more successful. And, if starting a regular habit is too involved, try to do new things for just a week or month. That way you don’t have to try to commit to things you may not enjoy. 30-day challenges are an amazing idea to try for your 19 for 2019 because they don’t require a ton of sacrifice. You get the opportunity to ‘try on’ a new habit for a month, and then you can determine whether you want to continue doing it or if it’s not working out for you. Not to mention, there are dozens of types of 30-day challenges that you can try! Health, food, fitness, organization- you name it! If you need some ideas for 30-day challenges to try out, here are some great links for your convenience! Why is that school is for kids? 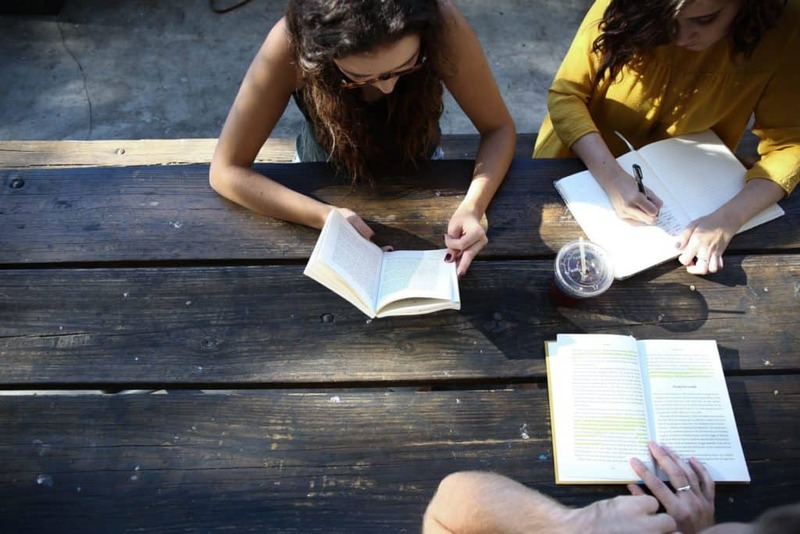 Learning is a lot of fun and can help tremendously with making life feel more purposeful. So why not use one of your 19 for 2019 goals for building a skill that you’ve always wanted to learn? If you’d like to try two free months of Skillshare for Planning Mindfully followers, you can do that here! Journaling is one of those activities where people always seem to want to start one but rarely do. Your 19 for 2019 is a great time to decide to add this habit into your daily routine. I’ve recently started journaling every morning before I start my day, and I find that it often helps me collect my thoughts. Check out this post on why you should keep a journal regularly! There are literally so many benefits to having a paper planner that it isn’t even funny. If you find you struggle with time management, keeping a planner can help you keep better tabs on your life and task list. Here are 8 benefits you’ll get to using a planner! Spend 2019 building better relationships, getting rid of toxic ones, and getting more involved with your communities. Here are some great ideas to try for your 19 for 2019. I’m sure every time you hop on social media, you always come across that one person (or five… or twenty) that you can’t stand. Maybe you’re always comparing yourself to them, or you have vastly different views on politics and religion. What’s beautiful with social media is you don’t have to litter your feeds with people who aren’t helping you improve yourself. Spend an afternoon and go through your social media accounts. Remove friends, groups, and pages if they no longer serve you a positive purpose. Some of us (like me!) find that when we need somebody to vent to, we just can’t find that ‘right’ person in our phone contacts. This may be your opportunity to make a new friend! Find somebody at work who looks like they need a friend, reach out to somebody new at church, or even rekindle an old friendship that’s fallen by the wayside. If trying to make just one friend seems difficult, or you’re having difficulty connecting with people in your social circles, join a club! Clubs are a great way to get to know other people with similar interests and may serve as a great opportunity to make new friends and add fun into your life. If you’re not sure where to get started, look no further than Meetup to see what clubs are offered in your community! You likely spent at least 20 hours a week with the people you work with regularly, and you’ve probably found that you’ve developed bonds with some of them. Why not invite them for a night out? It can be a better way to get to know them outside of work, and you definitely don’t have to worry about your supervisor overhearing your conversations. Those of us with children already spend a lot of time with our children. But how much do you know about what they love most? Where are their favorite places to play? Where do they like to eat? What types of activities do they gravitate toward? Having a special date with your child gives them the opportunity to spend time with you while engaging in what they love most; a best of both worlds, so to speak. What’s great is this is a really short activity, but you’ll likely find it so full of impact that you’ll probably want to do it again! If you have friends who have been there for you through thick and thin, why not do what you can to show how much you appreciate their love and guidance through the years? Throw them a party and show them how glad you are they are in your life. Make sure to try new things for your 19 for 2019! So many of us sit and lament that our lives are so boring, yet we don’t even do anything to fix it! Adding new activities to your mix doesn’t even have to be challenging, either! Here are some ideas you can try! Do you have a band that you love, you know all their songs and you buy their albums the second they go live? If you haven’t seen them in concert, you should! Check to see if they are going on tour and go have a blast! Going to a new place to eat doesn’t have to be challenging, but it’s certainly hard to get out of our comfort zones sometimes. Find a new restaurant in your town and go try it out! It’s up to you how adventurous you choose to be with this particular item as well. You can try a completely new style of food, or go to a new restaurant that serves food you already prefer. It doesn’t matter, just mix it up a little! Clothing is another area where we tend to be relatively boring, buying our clothing articles from the same store regularly. Why not jazz it up and try a new place? For me, it took me a long time to find the courage to buy clothing online! But after copious research and learning it’s relatively easy to return online, I bit the bullet and bought some amazing clothes from Europe! They had sizes that worked better for me than stores in America seem to, and once I got the pieces, I did not regret my choice! Better yet, I didn’t return a single clothing item, either! If you make crafts, you’ve probably been asked by friends, family, and coworkers to sell from time to time! Well, you can choose to expand your reach by starting an Etsy shop and selling your items to people all over the world. What’s great about Etsy is that you can literally create anything, from handmade to digital, small items to large. If you want to learn how to start an Etsy shop, go ahead and check out this incredible resource here! Guys- I LOVE to bullet journal. Adding a bullet journal to my daily routine has been an incredible lifesaver to my routine, mental health, and productivity. Bullet journals are a do it yourself planner, journal, and to-do list all wrapped up into one. They are much more flexible than a traditional planner, and can often help with promoting your creativity on a regular basis. Want to start a bullet journal? Check out this Ultimate How to Bullet Journal resource guide to get started! I think most of us can agree that we could all stand to improve our health. Many of us eat too much, don’t move enough, and feel sluggish while we go through our day. We make getting healthier sound more like a chore instead of a necessity. Thus, improving your health as part of your 19 for 2019 is a terrific goal! Why do we make drinking water to be so complicated? Most of us definitely do not drink the recommended amount of water daily (myself included). Make a goal to start drinking more water. You can do this by keeping a high-quality water bottle by you at all times because I find I mindlessly drink water if my water bottle is right in front of me. If the taste is the issue, get a water bottle that allows you to add fruit to jazz up the flavor a bit! A couch to 5K is a program that helps you start training to do a short marathon. You learn how to increase running gradually, so you build up stamina and prevent injury. If you want to do this, check out this great program here! Many of us resort to eating out regularly because frankly, cooking meals from scratch all the time can feel like such a pain. You can alleviate this problem with meal prepping! Take a day over the weekend and make 3-4 meals for the week all at once! My friend Jen has created this incredible meal prep guide that will help you become a pro at this in no time. Let’s face it, most of us don’t have the gumption to work out from home. We mean well, but it’s hard to work out when your bed is warm and distractions abound. Consider joining a gym, or a fitness class! If you want to make this more effective, find an accountability partner to join you! If you just asked on Facebook to see if anybody is looking for a workout buddy, I guarantee you’ll get at least a few replies. If meal prepping is a bit daunting, that’s OK. But eating at home is still a healthier alternative than going out to eat regularly. Keep staples that are easier to cook. You don’t have to do complex meals every single week. Cook chicken in the oven, throw some frozen veggies in the microwave, and you have a relatively healthy meal. Using a Crock Pot or an Instant Pot are another way to make life easier so you don’t have to spend your entire evening cooking. For those who aren’t able to join a gym for various reasons, we forget that just simply walking regularly can prove to be a powerful form of exercise that will help improve stamina, decrease weight, and improve heart function. During the warmer months, getting outside and enjoying fresh air can be some of the best medicine. During the winter, taking laps in malls and large department stores are ways you can continue the habit. There are even “Walk at Home” programs on Youtube, like this one here, that you can use when it’s too challenging to get out of the house. I can’t speak for other countries and communities, but in America, we consume far more sugar than recommended on a daily basis. It’s tough, I know! I cut out refined sugar in August 2018 and I’ve learned that sugar is literally in everything- from ketchup, to bread, and even sausage. Trying an experiment to cut out all sugar, or even just added sugar, can be a huge eye-opener in how much sugar you actually consume regularly. 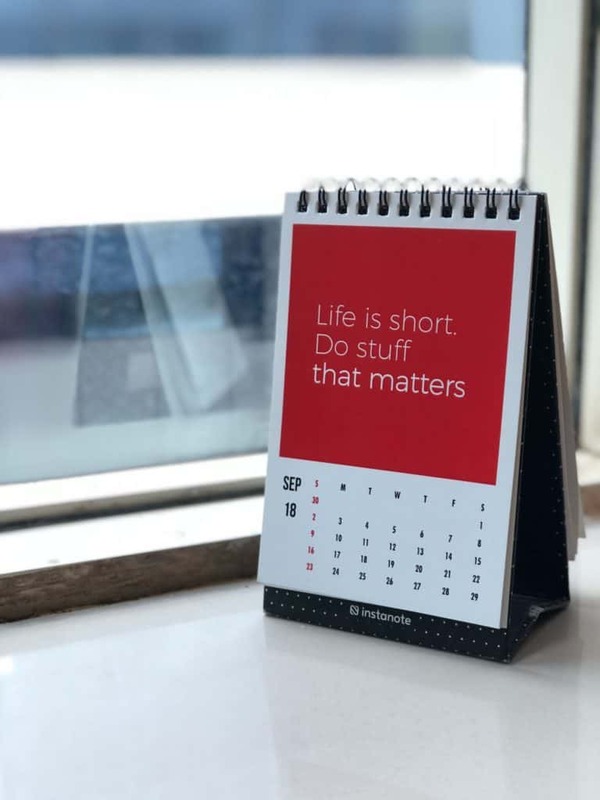 What’s neat about the 19 for 2019 is that your goals don’t have to be just about you. And you can use the year to help improve the lives of other people, as well! Here are some great ideas to consider. 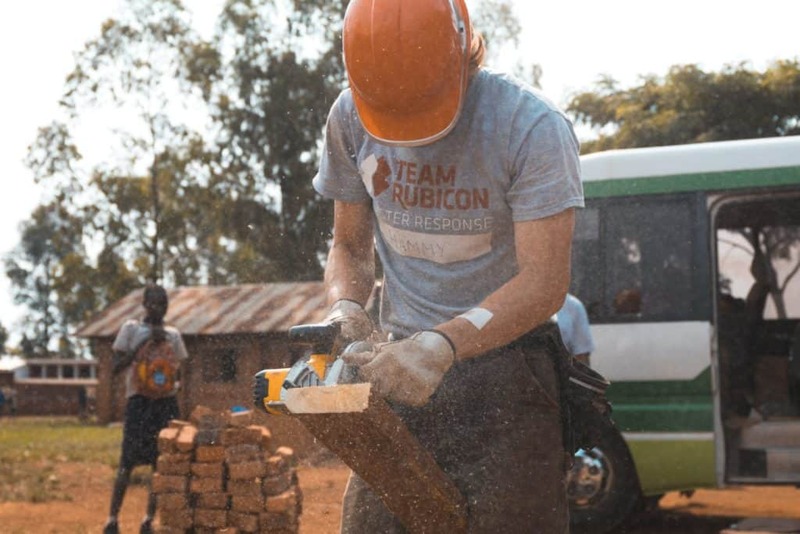 The best way to give back to your community is to volunteer, and there is no shortage of opportunities. From as small as reading to a classroom of preschoolers, to as large as helping homeless people get into housing, your assistance is powerful and necessary. Donating your blood to patients in need is a valuable gift that will never go away. While it doesn’t take a lot of time for us to do, it’s a lifesaving gift for many. It helps more than just cancer patients; it can be lifesaving for many surgeries, people with anemia, those who suffer from trauma, and more. When I was a child, I lived in a very poor environment. My mom was too ill to work, and I didn’t have a lot. One of my favorite memories is going to a local women’s shelter when I was four years old. My mom and I were ushered into a small room off the main entryway, and my eyes grew wide at the sight of SO many toys. And the most amazing thing happened- the lady in that room told me that they were for me. Many of us are so fortunate to be able to provide for our children, to give them what gives them happiness and joy. But there are so many children who were like me, who didn’t have the opportunity to have a lot. Donating to a toy drive is a great way to provide special Christmas, birthday, and other holiday presents these children wouldn’t have the opportunity to enjoy otherwise. Our society has us focusing less and less on our direct neighborhoods and communities, and it’s unfortunate. Our neighbors have been so tremendously helpful to our lives, and hopefully, we’ve been useful to them as well. One day, we found our neighbors garage door was open. It was winter; cold and bitter, with lots of snow. My husband noticed that no cars were in the garage, and everything was dark. We realized that nobody was home. So we decided to leave a note on their door, and we closed their garage door. Not long after, we found a nice card and a gift card in our mailbox from our neighbors. It meant a lot to us because all we desired was to make sure that our neighbors home was safe while they were away. But we’ve taken the opportunity now to make sure to reach out to our neighbors and let them know we are there for them. Do the same and connect with your neighbors. Give them a gift card, or invite them over for dinner. Developing the relationship with your neighbors will absolutely prove invaluable. If you’re wanting to improve your financial situation next year, try these various techniques to try for your 19 for 2019 list! Set a jar in your kitchen and empty your wallet of change once a week. This good habit can easily save you $50-$150 per year in LOOSE change. While it’s not a huge amount, it may gave you a fun little shopping spree at the end of the year, or you could put it toward paying bills and taxes. Next year is a great year to pay off a debt! Paying off a debt doesn’t have to be complicated either. Consider trying Dave Ramsey’s method of the ‘debt snowball’, where you pay the minimum amount on all except your lowest debt. Then you pay off the smallest debt as quickly as you can; any extra money should be thrown at that debt until it’s gone. Then, you take the minimum payment for the smallest debt once it’s paid off, and apply it to the next smallest debt. Read how to do the debt snowball method here! A yearly savings challenge can be a great way to save a couple hundred to a couple thousand dollars a year. Here are some yearly saving challenges you can try for your 19 for 2019. Pick your favorite! If you don’t have a lot of extra money per month, consider starting a side hustle instead! In my first year of blogging, I made over $20,000! That money was super helpful because I was still working at my full time job. Yes, I made $20,000 in my first year with a planner blog! Learn how to create a planner blog here! One of the most important things you can add to your 19 for 2019 list is to reconnect with your purpose. Here are some ideas you can try next year! 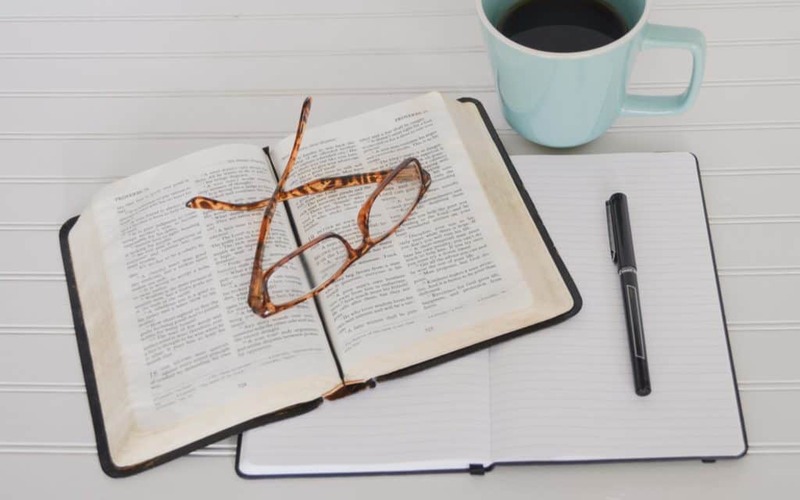 Taking a personal retreat where you either engage in quiet time, journaling, praying, and doing what you love most (or a mix of all four!) can be a powerful experience. Personal retreats where you can get away and spend time with yourself, reconnect with what you want in life, and create a plan for the next year will help relax and rejuvenate your soul. It’s glorious. Personal retreats don’t have to be lavish or expensive. Pack a journal and stay in a hotel nearby for a few days. Enjoy foods you love, sit by the pool, journal, read the bible- do whatever you need to help get yourself back to your best. If you don’t have time to spend multiple days or can’t afford a few days away, take a full day and do the things you love. Go to a place with beautiful scenery, go to the library, or any place that helps you feel your best. Studies show that 88% of CEOs read for 30 minutes a day. Reading is a great way to add more adventure, knowledge, and information in your life. Try reading one book a month, or create a list of books you’d like to read for 2019! A lot of us spend far too much time on technology these days, and it’s hard because it’s so readily accessible! Spend a day, a week, or a month off your devices. Get reconnected with nature, journal, and spend time with your family. If getting rid of all technology is impossible, stay off social media or apps that waste your time and energy. You can even make a habit of taking one day a week to stay off your devices. For instances, in my household, I stay off my work computer every Sunday. Many of us lament there is not enough time in the day to get things done. This may be the time where you have to literally create the time. I challenge you to try waking up even thirty minutes earlier than you currently do. Use this time for what you need to do to get to a place of better balance. Every morning, I do daily devotions, bible reading, and prayer. This helps me to feel better for the day. Other things you can do include the Miracle Morning, exercise, or even use this time to tackle chores so you can spend more time with your kids. It doesn’t matter what you do, just use this time to accomplish something you’re putting off. Technically, you can do anything you want. I mean, let’s face it, do you like your boring, comfortable life? Or do you long for more excitement and adventure? So for your 19 for 2019, use this time to add adventure in your life! We often make our biggest fears to be much stronger than they seem. It’s very easy to get caught up in the worst case scenario. One of the best ways to tackle our fears is to face them head-on. 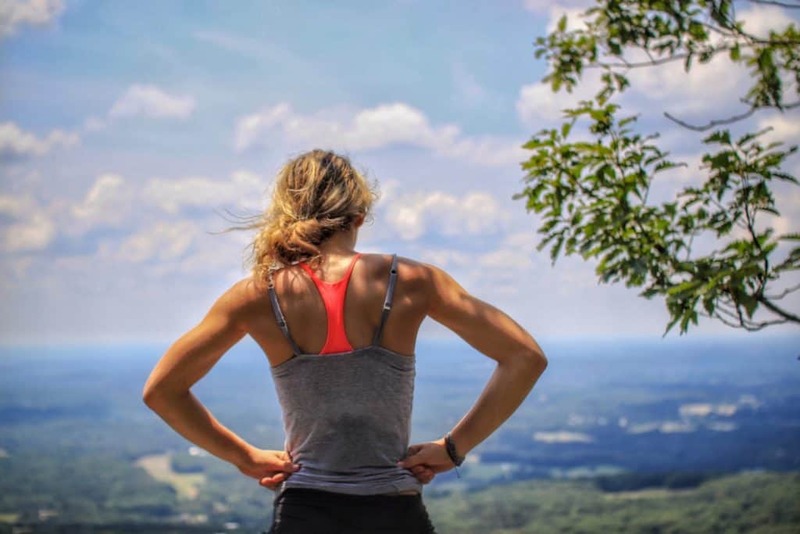 Whether it’s something you’ve always wanted to do, but have been too afraid to do (like skydiving), facing a phobia (like touching a spider), or telling your friend how you really feel about her boyfriend, most people find that when they have the courage to do something they fear, they usually succeed. I love rock climbing because it’s one of those activities that feels terrifying, but is generally pretty safe, especially when you go to a rock climbing facility. It’s great exercise, a perfect activity to do with friends, and it’s always such a rush when you get to the top! It can be really scary to initiate change. In fact, it’s probably just as scary to change yourself as it is to go skydiving or rock climbing. People tend to find a lot of value when they break out of their comfort zones and do something new. If facing your external fears like recommended above feels a bit too challenging to start (I don’t really want to hold spiders, either), change something about yourself. Get a wildly different haircut or dye your hair a color that would surprise people. Add more colors or patterns into your wardrobe. Or, better yet, start getting assertive! Learn to say ‘NO’ to the things that don’t add value in your life. While it can feel a bit scary to initiate these changes from within yourself, most people find once they’ve started, they wish they’d started sooner. Take 2019 to change something in your environment. Organize, and rearrange your space to help bring you more space and peace of mind. Here are some ideas you can consider for your 19 for 2019 list! I think everybody is a decorator at heart- at least, to some degree! Take some time next year to change a room in your house! Get out the paints, try some fun new accessories, and change the furniture. If you get overwhelmed at the thought of doing all of that, go simpler and just move your furniture around! Consider improving the flow of the room by optimizing the layout- and that doesn’t have to cost any money at all. Do you ever look in your closet after laundry day and STILL have a hard time coming up with an outfit to wear? Creating a capsule wardrobe is a great way to fix that problem without spending a ridiculous amount of money. You basically get key pieces to your wardrobe that you can mix, match, and replace easily to give you many fresh looks without having to spend an arm and a leg. If you’re wanting to learn how to do this, check out this amazing guide on how to build a capsule wardrobe! When people think of improving their environment, they often think of their physical environment. But why not your digital environment? The more time we spend online through our phones and computers, the more junk that piles up there as well. The most common place where our clutter accumulates is in our email inbox! When you have thousands of unopened emails, it makes it easier to miss the important emails, not to mention it just feels overwhelming looking at it. Decluttering your email inbox is more than just deleting your emails. It could include unsubscribing to email lists we never check, responding to emails we haven’t gotten to yet and sorting your emails into more digestible folders. Do you ever feel like you own the pile of clutter that never ends? May I ask- why in the world are you holding onto it? Is it adding any value to your life? Chances are, the reason you’re holding onto the clutter is the fear that you may need one of those items ‘just in case’. Instead, you actually don’t ever use it, and it continues to eat up large amounts of space in your home. Not sure how to cut the stuff? Try the 30 day minimalist game! If setting up a 19 for 2019 in your bullet journal is more than you were bargaining for, get your hands on this free printable! 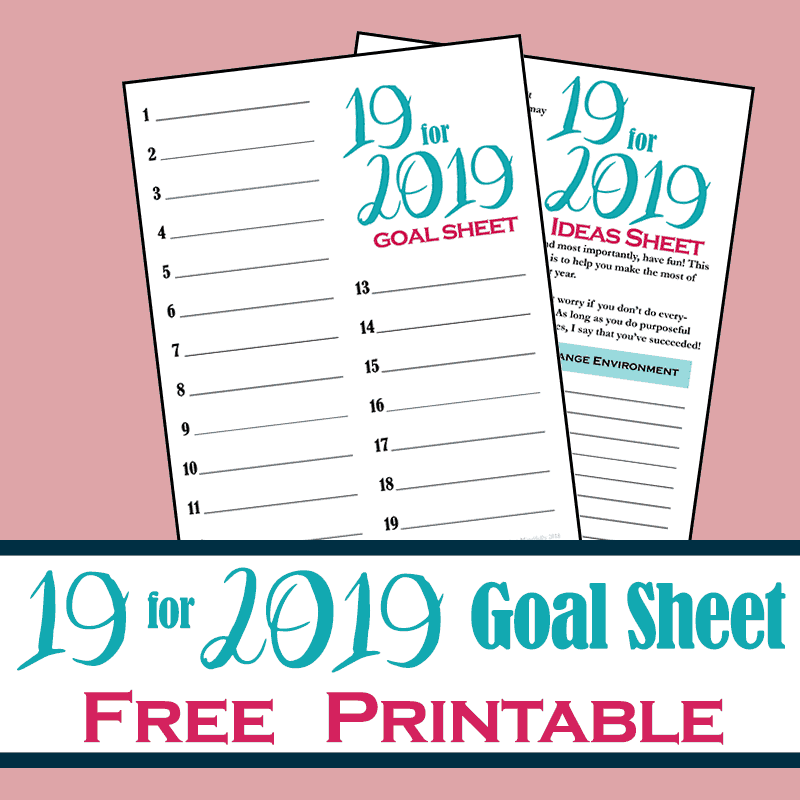 This free printable will not only give you space to write out your 19 goals for the next year, but you will also get a place to jot ideas down across the 10 categories in this blog post! 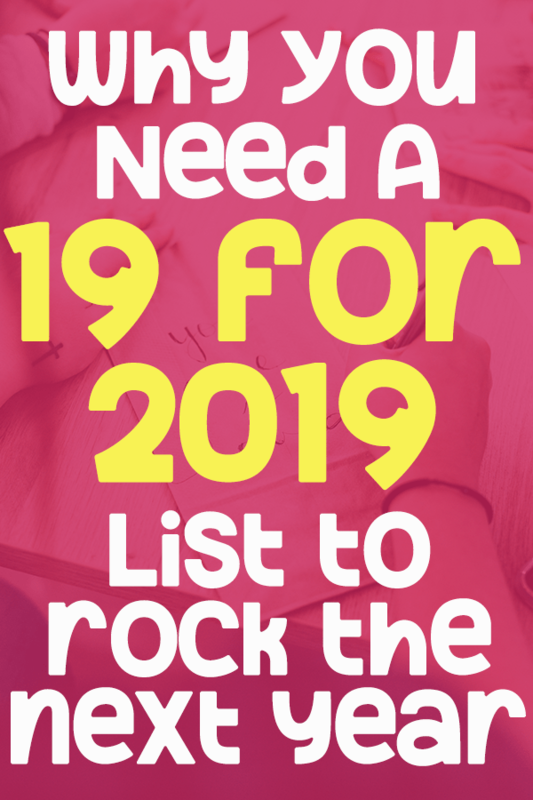 Write out different ideas you may have for your 19 for 2019 list, and then use the principles in this post to determine which ones will make the cut. This printable features black and white version and color versions. What Will You Pick for Your 19 for 2019? 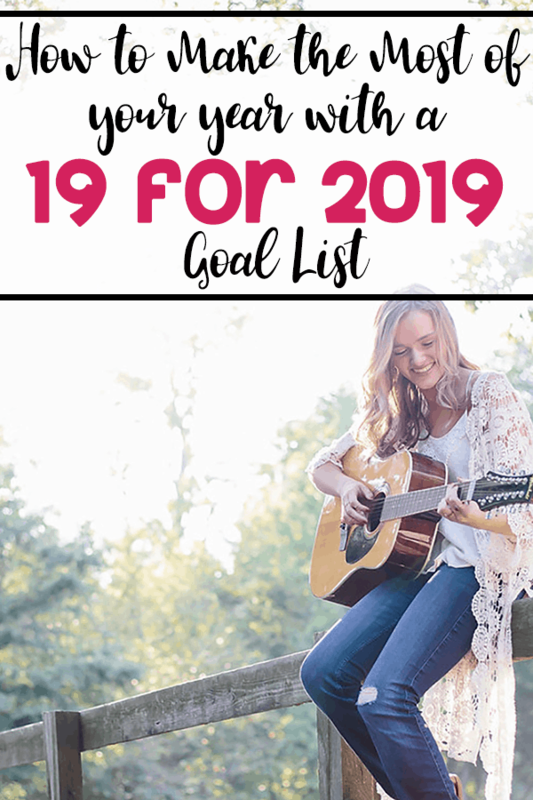 There are lots of ideas in this list to try for your 19 for 2019! Thankfully, you still have plenty of time to create your list before the new year starts! 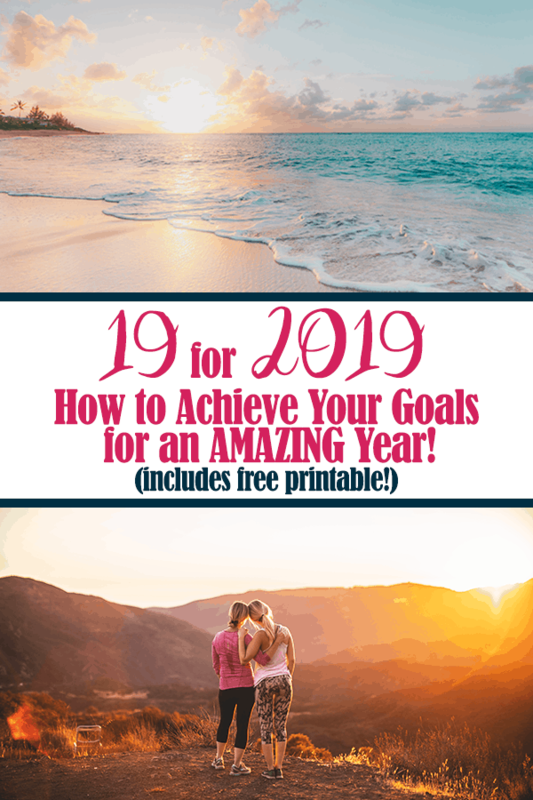 If you want to start planning for next year now, make sure to grab my free 19 for 2019 printable! This printable will help you write down your ideas for next year, along with giving you a summarized list of activities to try. What types of activities are you planning on accomplishing next year? Let me know in the comments! Did you get inspired to make a 19 by 2019 list?